The senior lockers outside Terri Jelinek’s NBC math classroom are decorated with numbers, counting down the students’ final high school days. Inside her classroom, there’s a planner on her desk also counting down the days. “10 more days of students!” is written on the bottom, highlighted in yellow. 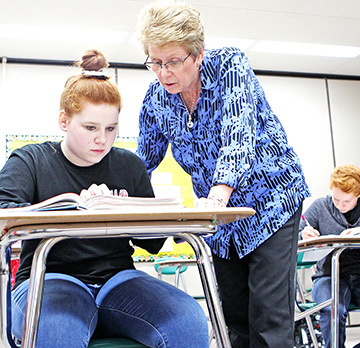 Jelinek explains that a substitute teacher created the daily planner retirement countdown, but she’s well aware of the approaching end to her 40 years of teaching, the last 30 of which have been at North Bend Central. Terri Jelinek helps a student during a review in the final days of her teaching career. She is retiring after 30 years at NBC, and 40 years of teaching overall. Jelinek, a Schuyler native who still lives there with her husband Gary, came to NBC in the fall of 1988 after 10 years of teaching at Humphrey High. Three decades later she has taught essentially every class in the NBC math department. That’s not to say there haven’t been changes in the way math is taught. In the early ‘90s, Jelinek had what she called a “life-changing” experience at a week-long seminar at Dana College. It featured a hands-on approach to teaching math, one that encouraged students to come up with their own solutions. She brought that hands-on approach to all her classes in at NBC. Jelinek saw calculus added to the NBC curriculum in 2000, bumping many existing math classes down a grade level. Seventh graders do what used to be taught in eighth grade. Many eighth graders take algebra, a class that used to be the domain of freshmen. Jelinek was an assistant volleyball coach her first three years at NBC. When she got out of that, she had an idea for anther extra curricular activity. A program called MathCounts where middle school students competedagainst other schools in “bee- style” problem-solving competitions using math. Jelinek asked the NBC administration if she could receive extra-curricular compensation for sponsoring a MathCounts program at NBC.